Cindy Thornton (b. 1975) is a contemporary illustrative painter currently residing in Orlando, Florida. 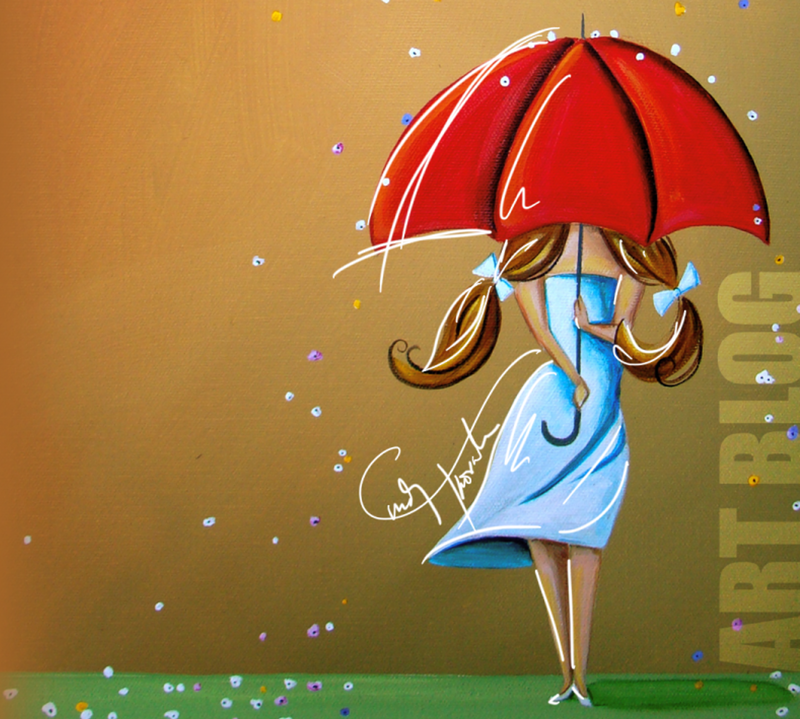 Her whimsical and vibrant style often incorporates bold colors, clean lines, and touches of surrealism. 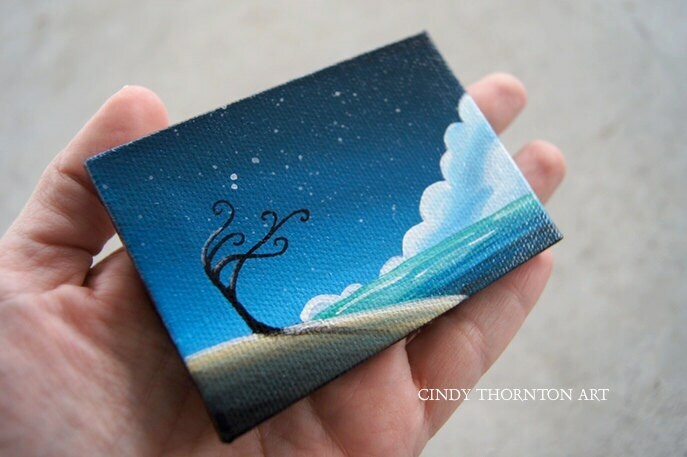 Many of Cindy’s paintings have unique and hidden meanings that challenge the imagination, but a common theme found throughout her work is love. That central theme is expressed, sometimes subtly, in thought-provoking dreamscapes that are frequently embellished with touches of quirkiness and humor. 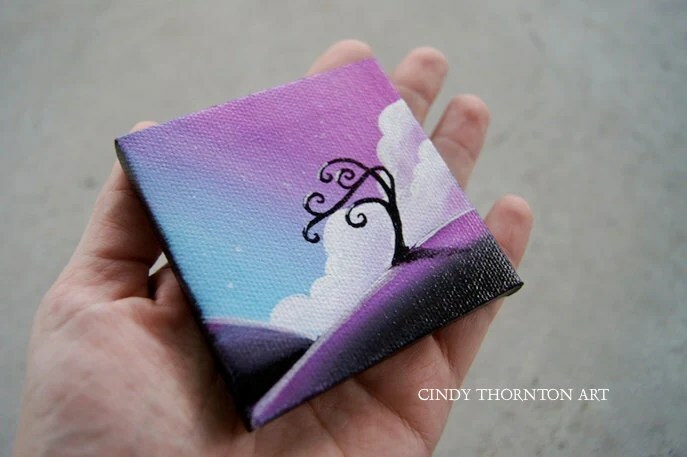 Much of Cindy’s work also conveys a sense of simplicity and childlike innocence. In fact, her three young children offer a tremendous source of inspiration. Cindy’s love of nostalgic music, interest in science, and appreciation of nature also influence her artistic choices. Cindy studied art in college but didn’t begin actively selling her paintings online until 2005. Since then, she’s been able to sell hundreds of original works to collectors around the world, collaborate with local and Asian galleries, and display her art annually at an international art fair in Taiwan. She also regularly participates in art events and festivals in the southeastern United States. When she’s not painting, Cindy enjoys family life with her husband and imaginative kids. Click to see current books available! I’m giving away these original paintings from now until the end of November as part of a holiday sale. 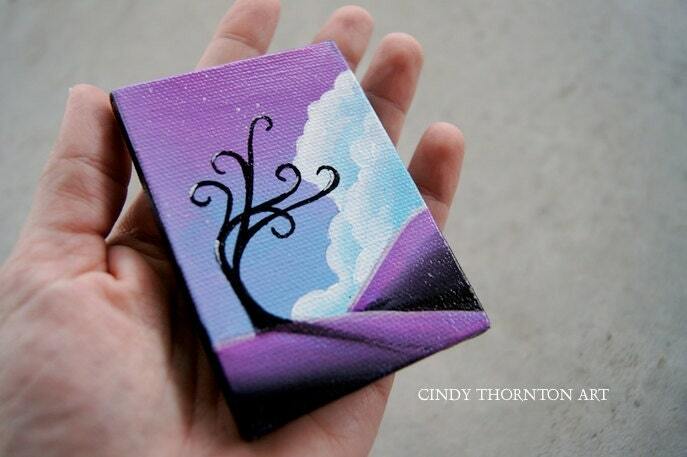 Any person who orders $100 or more in art from my etsy shop gets one of these free original mini paintings! As I write this, so far I’ve given away 4. Any pieces that are not given away will be available for purchase in my shop at $65 each on December 1st. You can visit my previous blog post for details here, but I wanted to show this group of 8 all together. Now Available: “Shy Little Siren” 16′ x 20″ x 3/4″ acrylic on stretched canvas original painting. For some reason, I don’t seem to paint “green” paintings that often. Well, this one is filled with the green underwater wavy grass and as you can see, a shy mermaid. This piece has a lot of movement and flow. The stalks of grass, the rising bubbles, and the mermaid hair all lend themselves to motion. This piece could almost fit into my girls series titled “Beauty of Imagination” as she is a girl with her face hidden (a lot of her is hidden). But I’m keeping her categorized in my Seafarers series as it’s a water piece with a lot of mystery. To see more info and detailed pics, she is currently available in my etsy shop here. Soooooo, I will be working on getting signed limited editions released this week. All signed prints will be limited to 20 in each edition. I will also be making these available in poster prints for those who want something larger…but they won’t be signed or made by me. All of my limited editions are printed on 8×10 size paper. So here is a picture of the original painting that I’ve titled “Cloud 9”. The original will be on exhibit at X-Power Gallery in Taipei, Taiwan in early 2012. Signed prints can be purchased here, and posters can be purchasedhere. Watch my facebook wall to catch the rest of the prints over the next few days….